New York-based dance duo Sofi Tukker were surprised with their first ever Platinum plaque in Toronto over the weekend for their breakout hit single “Best Friend (ft. NERVO, The Knocks & Alisa Ueno).” The group was presented with the plaque ahead of their highly anticipated show in Toronto by Ultra Music Canada and DMD Entertainment. 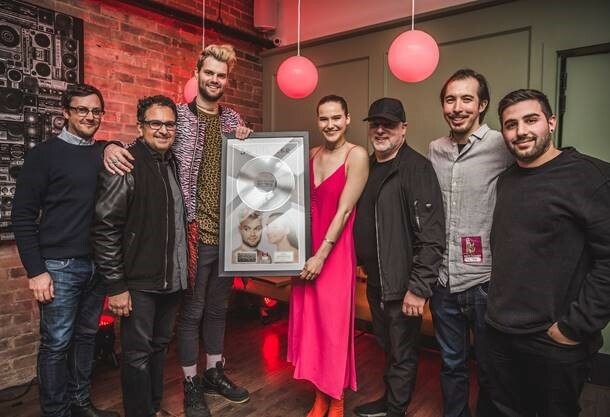 Sofi Tukker, which includes members Sophie Hawley-Weld and Tucker Halpern, shared the news with their fans through their social media channels, where they are seen posing with the plaque outside the Danforth Music Hall. They also brought the plaque on stage with them during the show in front of the roaring sold-out crowd. Watch the music video for “Best Friend” below.